There’s a difference between a disappointing season and a bad one, as far as Montreal Canadiens forward Alex Galchenyuk is concerned. Galchenyuk’s development seems to have stagnated further with a third consecutive ~50-point season, which is undeniably disappointing. Taking a step back to look at the big picture of this disastrous campaign, he’s still one point back of Brendan Gallagher, who’s had a truly great season, for the team scoring lead. Maybe it’s hard to compare the two. Offensive contributions from Gallagher have come to be expected, but not to the degree that anyone would have realistically expected 30 goals out of him after he suffered two injuries on the same hand. 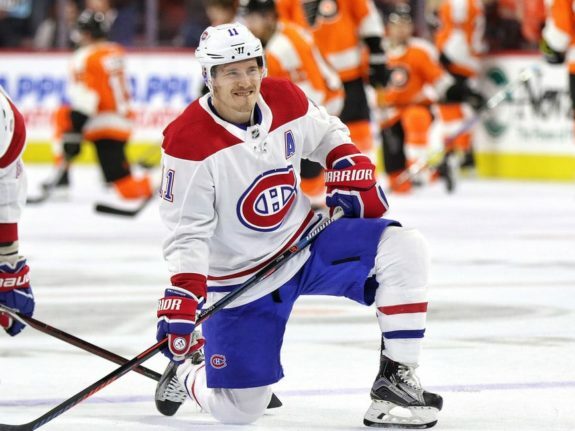 Besides, Gallagher’s always been a grit guy, whose value lies in how he gets under the skin of opponents, allowing his teammates, like Galchenyuk, to put up more points. So, it’s maybe an unfavorable double standard to Galchenyuk, who has a chance to score 20 goals this season, just 2 back with 5 games left. Even if he gets there, it’s a far cry from the career-high 30 he scored himself in 2015-16. That season truly put him on everyone’s radar as a potential scoring leader on this team. Two relatively forgettable seasons later, and he may be on the verge of accomplishing just that. It’s unlikely, sure, but consider how, entering Thursday night’s NHL action, Galchenyuk is just 8 points shy of the 56 he notched that season, again with 5 games left. It’s not that crazy that he matches that high-water mark, especially considering the relative hot streak he’s been on. Since Nov. 25, he’s scored 40 points (14 goals) in 54 games (.74 points per game). That means he only scored 8 in his first 23 (.35). Maybe it’s cherry picking stats. That Nov. 25 start date would nevertheless coincide with the point at which the Canadiens started a five-game win streak and miraculously climbed back into a playoff spot (only to eventually fall out completely) after starting the season 1-6-1 and 8-12-3. So, it wasn’t just Galchenyuk struggling… it was everyone. Only Galchenyuk has been able to rebound to a point at which he’s technically outpacing his career-best .72 point-per-game season from last year (44 points in 61 games). Granted, last season was one to forget overall. A knee injury derailed a scorching start for the Belarusian-American. In his first 24 games, he scored 23 points. By the point at which he got back in the line-up for good in February, he had lost his spot on the first line and struggled to gain traction with new-head-coach Claude Julien due to his defensive deficiencies. Injuries this season have since forced Julien’s hand to put him back on the top line, just not at center, where many still feel he deserves more of a chance than Jonathan Drouin. He’s arguably better defensively anyway… and we already know about the offense, with Drouin having struggled to break out offensively with his new team. Regardless, Galchenyuk’s producing like a top-line player, or at least similar to the likes of Tyler Johnson, Tyler Toffoli and Derick Brassard, who have similar cap hits. He’s meanwhile outproducing the likes of Tyler Ennis, Tomas Tatar and Nino Niederreiter. In other words, Galchenyuk is providing the Habs with good value. If he gets back to the point-per-game pace at which he scored to start 2016-17, it would be “great” instead. For the time being, “good” on a bad team will have to do. His season’s only disappointing because of how much better we all know he can be. That in and of itself is a reason why fans shouldn’t worry about Galchenyuk and be optimistic. Who would have known, as this 2017-18 write-off of a season draws to a close?